Apropos of the "doll messengers of friendship" which were sent to the school children of Japan by the school children of the United States this year, it might not be out of place to explain the manner in which our "Hina Matsuri" or "Hina-no-Sekku" (the Doll Festival) is actually celebrated here in this country. It is the greatest time of the year for the girls of Japan, and in preparation for the festival, every home which boasts of a small girl in the household sets up the best doll platform it can afford about a week ahead of the day. The doll stand, covered with crimson cloth, is arranged in four or five tiers with a prince and princess of the old Imperial Family on the top tier, with red and white robed court ladies and court musicians below, and with the lower shelves decorated with miscellaneous dolls, miniature furniture, and special delicacies for the dolls. Every year when the third of March approaches, all the little girls begin to long for that day of days with great impatience, and when it comes at last, the eldest daughter in each house becomes a dignified hostess. Dressing herself in her "Sunday best" she entertains her little friends, shows off her silken-garbed dolls and lacquered and gilded fittings and serves appropriate refreshments. In the evening, the Doll Festival is at its best. The long-stemmed paper lanterns are lighted, and they throw their soft romantic light on the beautifully dressed children. Father, mother, brothers and friends are invited to attend the ceremony, which is, as it were, an early lesson for little girls in formally entertaining guests. It is customary to start such a doll collection, after the arrival of the first daughter in each family, and from year to year some additional dolls are added, many of them representing historical characters or scenes from famous old plays. These are supplemented with tiny accessories, such as tea sets, toy animals and what-not. When the annual festival that usually lasts three days is over, the collection is carefully packed away. So, as time goes on, it becomes a rather impressive display. This year the Doll Festival was of especial importance in Japan, as it was the occasion for the reception of the "doll messengers of friendship" which had been sent by the American school children to their unseen little friends on this shore to participate in the Doll Festival. Indeed, among the most interesting events of recent years were the grand and elaborate receptions officially given to the doll guests which had arrived from America as messengers of good will and friendship. On March 3 were held two grand receptions, one in Tokyo and the other in Osaka, and many prominent persons, as well as hundreds of thousands of school children of both big cities, attended the ceremonies. Of course, the guests of the elaborate functions were the representatives of the dolls messengers, as it was not possible to have them all participate in the ceremonies, and also for the reason that all the scheduled shipments of dolls had not arrived from America in time. 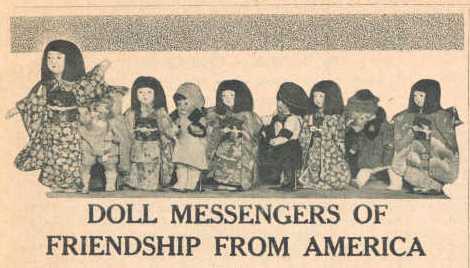 The project of sending such doll messengers to this country was actuated by the idea that good understanding and friendship should be cultivated in the hearts of the younger generation in both countries, and through the efforts of Dr. Sidney L. Gulick of the Good Relations Committee and other similar organizations in America, it was carried out quite successfully. Thousands upon thousands of dolls have found permanent homes in Japanese primary schools and kindergartens, there to bring into numerous families some talk of the love and friendship of the little American children. It was on January 17, when H.I.H. Prince Chichibu returned home from England on account of the death of the late Emperor Taisho, that the first consignment of the doll messengers arrived in Japan, and others soon followed. Some of them arrived at Yokohama, as did the first lot, and some at Kobe, where all of the dolls were warmly greeted by the little school children in the districts. Things were, however, rather unfortunate for the first party of dolls, for just at the time of their arrival, the whole country was in national mourning, and we all had to refrain from doing anything lively. But all the Japanese vernacular newspapers, considering the doll messengers' mission as significant, gave much prominence to stories about them. Some of the leading department stores in Tokyo and Osaka, with the special permission and help of the Department of Education, held doll exhibitions in their honor. 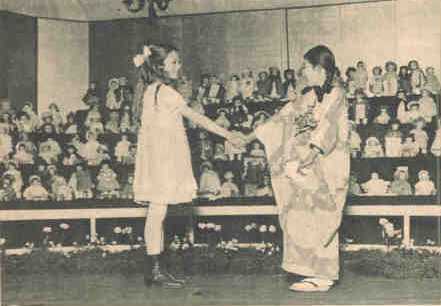 Prior to the arrival of the dolls from America, the Osaka Asahi, one of the leading and biggest newspapers in the Orient, offered prizes for the best "welcome song," and a Korean girl won the first prize with a clever and charming song which was set to a pleasing tune by a noted Japanese musician. This song was sung by school children at a reception given for the American dolls in the auditorium of the Osaka Asahi. Each of these doll messengers carried a little passport, just like a real American passport, signed by Mr. Saito, our Consul-General in New York, and a tiny ticket to Japan, and also a message of from 150 to 200 words, signed by all of the American children who had shared in the enterprise. 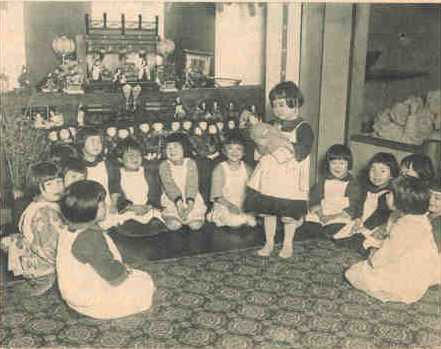 A special committee organized in the Department of Education under the direction of the vice-minister, Mr. C. Matsuura, had met and consulted with those concerned several times in connection with the plan of welcoming the doll messengers, and had set apart a large room in the government office building, where on their arrival, the dolls were immediately unpacked and arranged on tables. At the public reception at the Japan Y.M.C.A. 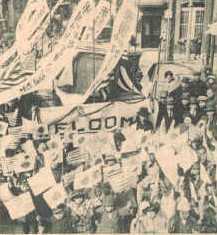 Building in Tokyo, on March 3, which was attended by high government officials and diplomats, and to which two thousand school children representing the pupils of the primary schools of Tokyo and Yokohama were invited, about forty Japanese school children, and an equal number of American school children, each with a doll in her arms, appeared on the platform in behalf of the children, and the ceremony of receiving the dolls from the American children was thus conducted in a touching and appropriate manner. Before that, an opening address was delivered by Mr. C. Matsuura, Vice-Minister of Education, in which he expressed his appreciation of the American undertaking. In the presentation of the dolls, Mr. Charles MacVeagh, American Ambassador, said that "in the same spirit in which Santa Claus always brings joy and happiness and love in the homes of our people on Christmas Day, I want to bring to you girls here, on this happy occasion of your Doll Festival, a message from the little girls across the Pacific--a message of real and abiding friendship, and of earnest and heartfelt wishes for your joy and happiness." This speech was responded to by Viscount Shibusawa, who at 88, was one of the most enthusiastic supporters of the event. Practically everything that occurred in connection with the doll messengers was taken in motion pictures, which are to be sent to America for exhibition. "Miss America" will be shown to Princess Shigeko Teru, the daughter of T.I.M. the Emperor and Empress and then will be preserved in the Tokyo Museum of the Department of Education. Moreover, on the Doll Festival, March 3, with the purpose of making the public thoroughly acquainted with this expression of American friendship, Mr. S. Kikuchi, head of the Section of Primary Schools of the Department of Education, gave a radio talk over JOAK during the children's hour and explained all about the project, transmitting the spirit of the givers to the receivers. All the schools and kindergartens in various sections of this country which received the dolls held their own welcome meetings. In the meantime, a plan to reciprocate the kindness of the American children is now under way, and it seems sure that in the very near future a similar charming expression of good will and friendship will be sent back to the children of the United States by our children of Japan under the guidance of the authorities concerned.